Aneurysmal subarachnoid hemorrhage (aSAH) affects 27,000 Americans, resulting in 14,000 deaths annually . While accounting for only 3% of all strokes, subarachnoid hemorrhage accounts for 27.3% of all stroke-related years of potential life lost . This disproportionate increase in morbidity and mortality is linked to the devastating complications following rebleeding, and cerebral vasospasm, which accounts for up to 50-80% and 23% morbidity and mortality, respectively [3, 4]. Early management is aimed at controlling hypertension  until the aneurysm can be secured by endovascular coiling or surgical clipping to avoid rebleeding. Subsequently, the focus shifts to allowing cerebral autoregulation at higher cerebral perfusion pressures for treatment of cerebral vasospasm . Patients suffering from aSAH may manifest cardiovascular perturbations like neurogenic myocardial stunning, a reversible stress-induced cardiomyopathy  that can cause troponin elevation [8, 9], EKG changes , or regional wall motion abnormalities [11, 12]. Post-rupture day 3 troponin-I elevation > 0.3 mg/L predicts mortality in SAH . Management of complications of aSAH often involves beta blockade  to counteract the sympathetic nervous system (SNS) surge [15-17]. Beta blocker administration in the setting of left ventricular dysfunction decreases troponin elevation . The SNS also plays a role in stimulating the inflammatory cascades that result in endothelial dysfunction and mismatch of vasoconstrictors and vasodilators (increased endothelin and decreased nitric oxide), ultimately leading to vasospasm . Beta agonism is linked to upregulation of interleukin-6 and tumor necrosis factor-α levels, while β2 antagonism attenuates the acute surge of interleukin-6 in rat CSF following SAH . The use of statins as anti-inflammatory modulators has shown mixed results in terms of improving outcomes in SAH, but a recent summary found that statins, while having an equivocal effect on vasospasm, do seem to decrease delayed infarctions . The pathophysiology of vasospasm is complex and multifactorial. The multiple avenues through which sympathetic modulation can affect the neurologic and cardiogenic sequelae of aSAH makes it an interesting strategy to improve outcomes. We sought to investigate the relationship of beta blockade with the development of radiographic vasospasm, subsequent infarction, and poor clinical discharge status in aSAH. We conducted an Institutional Review Board approved retrospective examination of adult patients admitted to the Surgical Intensive Care Unit (SICU) for management of ruptured aSAH between September 2004 and August 2010. Study groups were isolated relevant to beta blockade: No/No group were never beta blocked; No/Yes group were beta blocked during hospital admission; Yes/Yes group were on a preadmission beta blocker and continued during hospital admission; Yes/No group had preadmission beta blockade stopped after admission. Beta blockers used by patients varied from β1-selective (atenolol, esmolol, metoprolol) to nonselective (carvedilol, labetalol, propranolol, sotalol). Preadmission beta blockers were assumed to have been administered if included on a patient’s home medication list . Postadmission beta blockade was considered Yes if even a single dose was given during hospitalization. Records were analyzed for baseline characteristics, treatment modalities, radiographic evidence of vasospasm with or without cerebral infarction, discharge status and death. Hunt and Hess grading and Glasgow Coma Scale were obtained from admission examination in the emergency department. Fisher grade was calculated from the CT scan on presentation. Severity of comorbid conditions was assessed using the Portsmouth modified Physiological and Operative Severity Score for the enumeration of Mortality and Morbidity (P-POSSUM) . SICU management of patients admitted for aSAH included serial evaluations for evidence of vasospasm. Radiographic vasospasm was evaluated by transcranial Doppler , CT angiogram, or conventional angiography and assessed by a radiologist. Screening transcranial Doppler examinations were typically done three times a week. TCD velocities of middle cerebral arteries, 80-120 cm/s was considered mild vasospasm, 120-160 cm/s was moderate vasospasm, and >160 cm/s was severe vasospasm. For anterior cerebral arteries, >120-140 cm/s was considered probable vasospasm while >140 cm/s was definite vasospasm. For posterior cerebral arteries, >90-130 cm/s was considered probable vasospasm while >130 cm/s was definite vasospasm. If moderate or severe vasospasm was identified and/or there was a new neurologic deficit or decline, CT angiogram or cerebral angiography was performed. Vasospasm was treated with triple-H therapy , angioplasty, or intracerebral arterial vasodilator injection at the discretion of the Neurosurgeon in collaboration with the Intensivist and Neurointerventionalist. All patients were given 21 days of nimodipine, starting from the day of rupture. Delayed infarction related specifically to vasospasm was defined as infarct occurring within the same vascular territory, correlating with acutely deteriorating neurologic exam, nonexistent on initial scans/presentation or related to surgery and was identified by CT or MRI. Outcome measures after aSAH were evaluated. Ability to attend to activities of daily living was assessed on discharge using Cerebral Performance Category (CPC), with scores of 1-2 (mild to moderate cerebral disability) defined as optimal . Discharge outcomes were defined as Good if patients were discharged home or to a rehabilitation facility and Poor if they were discharged to a skilled nursing/subacute facilities or died. Patient characteristics and comorbidities, aneurysmal attributes, and treatment modalities were compared between the groups. Each variable was analyzed for statistically significant differences among groups using Pearson's Chi-square test for discrete categorical data and one-way ANOVA for continuous data. Outcomes were evaluated via multivariable analysis through logistic regression and adjusted for potential confounders, defined as variables associated with >20% change in the incidence of the outcome. Confounders for vasospasm included age and presence of heart disease. For infarction, confounders were P-POSSUM and aneurysm location. Confounders for poor discharge characteristics were age, P-POSSUM, and CPC. These confounders were used as covariates in the multivariable analysis of each clinical outcome. Odds ratios for outcomes were calculated by setting the odds ratio for the No/No (reference group) patients to 1 and presented as adjusted odds ratios (aOR) with 95% confidence intervals. Statistics were computer generated with IBM SPSS Statistics version 20 (IBM Corporation, Armonk, NY) and JMP 8.0.2 (SAS Institute, Cary, NC). A p-value ≤ 0.05 was considered significant. Patient selection is shown in Fig. (1). We conducted a chart review of 455 patients who had admission diagnosis of subarachnoid hemorrhage between 8/2004 and 9/2010. We excluded 201 patients who were not identified as having aSAH. Another 36 patients were excluded from analysis for the following exclusion criteria: patients who expired within 3 days of admission (n = 7); patients transferred from another hospital only for surgical intervention and subsequently transferred back to the referring facility (n = 6); those who had a major complication from surgery or a catastrophic rebleed (n = 4); patients with inadequate radiological studies to assess for vasospasm in the first 7 days (n = 18); and one patient in the Yes/No group due to inadequate power to use for analysis. Fig. (1). Study patient screening and selection. 455 patients were initially screened, 218 were included for study. Yes/No: Preadmission without post-admission beta blockade. Yes/Yes: Preadmission and post-admission beta blockade. No/Yes: Post-admission beta blockade only. No/No: No beta blockade. A total of 218 patients were included for analysis. As seen in Table 1, baseline characteristics were not equal among the three study groups. Patients who were taking beta blockers prior to admission were older and had the highest comorbidity with less optimal P-Possum Score despite intermediate GCS and a low incidence of an elevated Hunt and Hess score. Patients initiated on beta blockade after admission had lower GCS, higher Hunt and Hess scores and more Fisher grade 4 aSAH. Patients never beta blocked were younger, had the highest GCS, with lower P-POSSUM scores, Hunt and Hess score and Fisher Grade. They were also less likely to receive triple H therapy or ventricular drainage. Of note, the use of inotropes or vasopressors, angioplasty or cerebral arterial vasodilator injection, or clipping versus coiling was not different between groups. Table 1. Baseline Characteristics: Patient characteristics and comorbidities, aneurysmal characteristics, treatment modalities, and Cerebral Performance Category at discharge. Statistically significant if p ≤ 0.05. No/No: No beta blockade. No/Yes: Post-admission beta blockade only. Yes/Yes: Preadmission and post-admission beta blockade. Vasospasm was radiographically confirmed in 145 out of the 218 patients by transcranial Doppler, CT angiogram, or conventional angiogram as described in the Methods. Of these, 47 consequently infarcted, and 53 died or required care in a long-term facility. 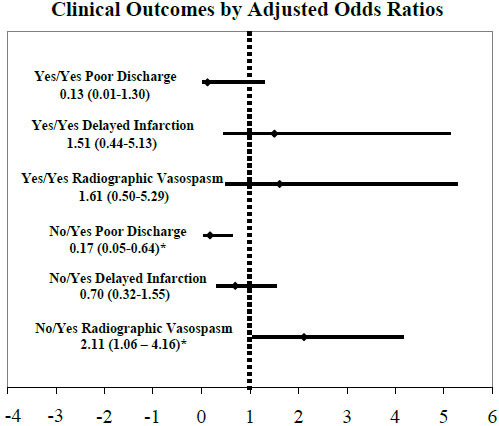 Table 2 shows the incidences of radiographic vasospasm, delayed infarction, and poor discharge outcomes along with the adjusted odds ratios and 95% confidence intervals. Radiographic vasospasm was adjusted for the presence of heart disease and age, while infarction was adjusted for P-POSSUM and aneurysm location. Poor discharge characteristics was adjusted for age, P-POSSUM, and Cerebral Performance Category. Fig. (2) shows that patients initiated on beta blockade after admission (No/Yes) had significantly increased radiographic vasospasm (aOR 2.11 (1.06-4.16)). However, despite the increased incidence of vasospasm, these patients had significantly fewer deaths or need for long term care (aOR 0.17 (0.05-0.64)), with decreased tendency for infarcts (aOR 0.70 (0.32-1.55)). In the population already on a beta blocker (Yes/Yes) during aneurysmal rupture, there was a trend toward increased vasospasm (aOR 1.61 (0.50-5.29)) that led to infarction (aOR 1.51 (0.44-5.13)), with decreased mortality or need for long term care in a facility (aOR 0.13 (0.01-1.30)). Fig. (2). Adjusted odds ratios for clinical outcomes, shown with 95% confidence intervals. No/No patients were assigned odds ratio of 1. No/Yes patients had significantly increased vasospasm but improved discharge outcome. *Statistically significant Yes/No: Preadmission without post-admission beta blockade. Yes/Yes: Preadmission and post-admission beta blockade. No/Yes: Post-admission beta blockade only. No/No: No beta blockade. Table 2. Incidence and adjusted odds ratios for clinical outcomes. While the incidences of clinical outcomes were not significantly different, after adjusting for confounders, No/Yes patients had significantly increased vasospasm but decreased poor discharge characteristics. Incidences considered statistically significant if p ≤ 0.05. *Adjusted OR statistically significant according to 95% confidence intervals. No/No: No beta blockade. No/Yes: Post-admission beta blockade only. Yes/Yes: Preadmission and post-admission beta blockade. CI: confidence interval. Because patients received a variety of beta blockers active at different adrenergic receptors, we secondarily analyzed the effect of adrenergic selectivity on outcomes in patients who received post-admission beta blockade. When patients who received β1-blockers exclusively (n = 16) were compared to patients who received non-selective beta blockers (β1, β2, and α1; n = 86), there was no significant difference in the incidence of radiographic vasospasm, infarction, or poor discharge characteristics on univariate logistic regression, as seen in Table 3. Patients who received both classes of beta-blockers (n = 38) were excluded from this analysis. Table 3. Unadjusted odds ratios of beta-selectivity on clinical outcomes. No statistically significant differences between effects of β1 selective and non-selective β blockers on outcomes as indicated by 95% confidence intervals on univariate logistic regression. CI: Confidence interval. Cardiogenic and neurologic complications of aSAH could be subject to sympathetic nervous system modulation at multiple points of several pathophysiologic pathways. Although limited by the retrospective study design, we found an association between initiation of beta blockade after admission and better discharge outcome after adjusting for statistically significant confounders between our study populations. No/Yes patients had better outcome than No/No patients after adjusting for greater age and more comorbidity despite worse aSAH as measured by GCS, Hunt Hess and Fisher grade at admission. The Yes/Yes group was older with more severe comorbidities such as hypertension and heart disease, which explains why these patients were on preadmission beta blockers. The sample size from this group was also quite small, less than 10% of the study participants, impeding our ability to achieve enough power to elucidate significant outcomes differences in relation to preadmission beta blockade. Despite the lack of power, the trend in vasospasm and poor discharge characteristics in the Yes/Yes group mimicked the significant findings of increased vasospasm but improved discharge characteristics in the No/Yes group. Sympathetic modulation in cerebral arteries is not well understood in the setting of vasospasm. Beta adrenergic reactivity has been identified in rat and human cerebral arteries in studies of cerebral hyperemia, where vasodilation occurs because of increased sympathetic surge secondary to hypoglycemia or emergence from anesthesia. Beta-blocker administration in studies has been shown to decrease cerebral blood flow [26-28]. However, when cardiac output is evaluated with esophageal Doppler while concurrently measuring cerebral blood flow velocity, no correlation between these parameters is found, suggesting that the decrease in cardiac output seen with beta-blocker does not explain the cerebral blood flow velocity reduction . This infers that beta-blockers seem to have an effect on cerebral circulation that is independent of its cardiac effects. Whether attenuation of cerebral vasodilation induced by beta blockade occurs in vasospasm is not known. However this effect could explain why radiographic vasospasm rates were higher in No/Yes post-admission beta blockade administered patients. The more frequent Fisher grade 4 hemorrhages in No/Yes patients may have contributed to higher vasospasm incidence, so it is possible that beta blockade attenuated the cerebral vasodilation associated with sympathetic surge. As the risk for vasospasm is the highest in those with Fisher grade 3 hemorrhages , a notable finding here was the association of post-admission beta blockade with increased vasospasm despite a lower grade of these hemorrhages. It is unclear why despite increased vasospasm we found improved outcomes in patients started on beta blockade after hospital admission. This is similar to nimodipine treatment, which is also associated with improved outcomes in aSAH despite no reduction in the incidence of vasospasm . Recent studies have shown that preadmission beta blockade may be beneficial in reducing the incidence of neurogenic stunned myocardium, which may play a role in the outcome after aSAH . In addition, subarachnoid hemorrhage is a potent inducer of the inflammatory pathway, which also could be modulated with beta blockade. While statins may be associated with improved outcomes, other anti-inflammatory mediators, such as the endothelin-1 receptor antagonist clazosentan, have not resulted in better long term outcomes despite significantly lowering vasospasm in phase 3 trials . Those authors implied that vasospasm is less contributory to determining discharge status or mortality in aneurysmal subarachnoid hemorrhage. The finding of improved outcomes with beta blockade despite increased vasospasm may echo this sentiment. Furthermore, patients who received post-admission beta blockade had better discharge characteristics despite Hunt and Hess scores of 4 and 5, which are associated with 70-100% risk of mortality. There are several limitations to this study in addition to those inherent in retrospective analysis. We were unable to assess the incidence of cardiogenic complications such as neurogenic myocardial stunning at initial presentation in this retrospective analysis as most study participants were transferred from outside hospitals without having undergone cardiac studies. Another limitation was the fact that monitoring for vasospasm or infarction via imaging varied among patient populations. Those who had worse Fisher grade or Hunt and Hess scores with fluctuating neurologic deficits were scanned more frequently. It is possible that radiographic vasospasm could have been missed in those who had milder presentations, as radiographic vasospasm does not always cause a neurologic deficit. The effect on clinical outcomes of patients who are surgically clipped compared to endovascularly coiled is debated in the literature. One meta-analysis showed no difference in vasospasm and infarct in regards to modality of aneurysm securement , while another showed that coiling was associated with less vasospasm, but no difference in infarct or clinical performance as assessed with Glasgow outcome scoring . However, only high Fisher grade subarachnoid hemorrhages were included in the latter study. There was no significant difference in the incidence of coiling versus clipping among our study groups and univariate analysis did not identify modality of aneurysm securement as a confounder in regards to radiographic vasospasm, infarction, or poor discharge outcomes, so it is likely that any effect of clipping vs. coiling on analyzed outcomes was equally represented in each study group. The devastating complications of aSAH such as rebleeding, vasospasm, and neurogenic myocardial stunning may be linked to a surge in catecholamine release by the sympathetic nervous system. Sympathetic surges can cause spikes in blood pressure, and also may cause increase inflammation that can lead to rebleeding. Beta agonism may cause cerebral vasodilation with consequent intracranial hypertension, which is especially concerning in higher Fisher grade hemorrhages where obstructive hydrocephalus occurs. Finally, catecholamines can stress the heart, leading to profound transient cardiomyopathy and left ventricular dysfunction, compromising cerebral perfusion. The sum of these pathways can result in delayed cerebral infarction, culminating in catastrophic neurologic decline. For these reasons, beta blockade may be beneficial in improving outcomes in aneurysmal subarachnoid hemorrhage. While detection and prognostication of neurocardiogenic complications of aSAH have become more sophisticated, there are few therapies proven to protect either the brain or the heart from significant harm. The clinical impact of beta blockade could be significant in its ability to protect both from the sympathetic surge that occurs following aneurysmal rupture. Subsequent prospective studies would assist in elucidating the apparent inconsistency of improved discharge characteristics despite increased incidence of vasospasm with post-admission beta blockade and perhaps, provide a new and elegant means to improve outcomes in aSAH. Schievink WI. Intracranial aneurysms. N Engl J Med 1997; 336(1): 28-40. Johnston SC, Selvin S, Gress DR. The burden, trends, and demographics of mortality from subarachnoid hemorrhage. Neurology 1998; 50(5): 1413-8. Ohkuma H, Tsurutani H, Suzuki S. Incidence and significance of early aneurysmal rebleeding before neurosurgical or neurological management. Stroke 2001; 32(5): 1176-80. Diringer MN. Management of aneurysmal subarachnoid hemorrhage. Crit Care Med 2009; 37(2): 432-40. Wartenberg KE, Schmidt JM, Claassen J, et al. Impact of medical complications on outcome after subarachnoid hemorrhage. Crit Care Med 2006; 34(3): 617-23. Bederson JB, Connolly ES Jr, Batjer HH, et al. Guidelines for the management of aneurysmal subarachnoid hemorrhage: a statement for healthcare professionals from a special writing group of the Stroke Council, American Heart Association. Stroke 2009; 40(3): 994-1025. Banki N, Kopelnik A, Tung P, et al. Prospective analysis of prevalence, distribution, and rate of recovery of left ventricular systolic dysfunction in patients with subarachnoid hemorrhage. J Neurosurg 2006; 105(1): 15-20. Kopelnik A, Fisher L, Miss JC, et al. Prevalence and implications of diastolic dysfunction after subarachnoid hemorrhage. Neurocrit Care 2005; 3(2): 132-8. Naidech AM, Kreiter KT, Janjua N, et al. Cardiac troponin elevation, cardiovascular morbidity, and outcome after subarachnoid hemorrhage. Circulation 2005; 112(18): 2851-6. Zaroff JG, Rordorf GA, Newell JB, Ogilvy CS, Levinson JR. Cardiac outcome in patients with subarachnoid hemorrhage and electrocardiographic abnormalities. Neurosurgery 1999; 44(1): 34-9. Kothavale A, Banki NM, Kopelnik A, et al. Predictors of left ventricular regional wall motion abnormalities after subarachnoid hemorrhage. Neurocrit Care 2006; 4(3): 199-205. Lee VH, Oh JK, Mulvagh SL, Wijdicks EF. Mechanisms in neurogenic stress cardiomyopathy after aneurysmal subarachnoid hemorrhage. Neurocrit Care 2006; 5(3): 243-9. Yarlagadda S, Rajendran P, Miss JC, et al. Cardiovascular predictors of in-patient mortality after subarachnoid hemorrhage. Neurocrit Care 2006; 5(2): 102-7. Walter P, Neil-Dwyer G, Cruickshank JM. Beneficial effects of adrenergic blockade in patients with subarachnoid haemorrhage. Br Med J (Clin Res Ed) 1982; 284(6330): 1661-4. Naredi S, Lambert G, Edén E, et al. Increased sympathetic nervous activity in patients with nontraumatic subarachnoid hemorrhage. Stroke 2000; 31(4): 901-6. Naredi S, Lambert G, Friberg P, et al. Sympathetic activation and inflammatory response in patients with subarachnoid haemorrhage. Intensive Care Med 2006; 32(12): 1955-61. Zaroff JG, Pawlikowska L, Miss JC, et al. Adrenoceptor polymorphisms and the risk of cardiac injury and dysfunction after subarachnoid hemorrhage. Stroke 2006; 37(7): 1680-5. Cruickshank JM, Neil-Dwyer G, Degaute JP, et al. Reduction of stress/catecholamine-induced cardiac necrosis by beta 1-selective blockade. Lancet 1987; 2(8559): 585-9. Dhar R, Diringer M. Statins and anti-inflammatory therapies for subarachnoid hemorrhage. Curr Treat Options Neurol 2012; 14(2): 164-74. Kato H, Kawaguchi M, Inoue S, Hirai K, Furuya H. The effects of beta-adrenoceptor antagonists on proinflammatory cytokine concentrations after subarachnoid hemorrhage in rats. Anesth Analg 2009; 108(1): 288-95. Tseng MY. Summary of evidence on immediate statins therapy following aneurysmal subarachnoid hemorrhage. Neurocrit Care 2011; 15(2): 298-301. Midwinter MJ, Tytherleigh M, Ashley S. Estimation of mortality and morbidity risk in vascular surgery using POSSUM and the Portsmouth predictor equation. Br J Surg 1999; 86(4): 471-4. Grosset DG, Straiton J, du Trevou M, Bullock R. Prediction of symptomatic vasospasm after subarachnoid hemorrhage by rapidly increasing transcranial Doppler velocity and cerebral blood flow changes. Stroke 1992; 23(5): 674-9. Lee KH, Lukovits T, Friedman JA. Triple-H therapy for cerebral vasospasm following subarachnoid hemorrhage. Neurocrit Care 2006; 4(1): 68-76. Ajam K, Gold LS, Beck SS, Damon S, Phelps R, Rea TD. Reliability of the Cerebral Performance Category to classify neurological status among survivors of ventricular fibrillation arrest: a cohort study. Scand J Trauma Resusc Emerg Med 2011; 19: 38. Grillo P, Bruder N, Auquier P, Pellissier D, Gouin F. Esmolol blunts the cerebral blood flow velocity increase during emergence from anesthesia in neurosurgical patients. Anesth Analg 2003; 96(4): 1145-9. Hollinger BR, Bryan RM. Beta-receptor-mediated increase in cerebral blood flow during hypoglycemia. Am J Physiol 1987; 253(4 Pt 2): H949-55. Santizo RA, Koenig HM, Pelligrino DA. beta-Adrenoceptor and nNOS-derived NO interactions modulate hypoglycemic pial arteriolar dilation in rats. Am J Physiol Heart Circ Physiol 2001; 280(2): H562-8. Fisher CM, Kistler JP, Davis JM. Relation of cerebral vasospasm to subarachnoid hemorrhage visualized by computerized tomographic scanning. Neurosurgery 1980; 6(1): 1-9. Welty TE. Use of nimodipine for prevention and treatment of cerebral arterial spasm in patients with subarachnoid hemorrhage. Clin Pharm 1987; 6(12): 940-6. Liang CW, Chen R, Macri E, Naval N. Preadmission beta-blockers are associated with decreased incidence of neurogenic stunned myocardium in aneurysmal subarachnoid hemorrhage. J Stroke Cerebrovasc Dis 2013; 22(5): 601-7. Crowley RW, Macdonald RL. Is vasospasm actually bad for you? World Neurosurg 2011; 76(1-2): 6.
 de Oliveira JG, Beck J, Ulrich C, Rathert J, Raabe A, Seifert V. Comparison between clipping and coiling on the incidence of cerebral vasospasm after aneurysmal subarachnoid hemorrhage: a systematic review and meta-analysis. Neurosurg Rev 2007; 30(1): 22-30. Dumont AS, Crowley RW, Monteith SJ, et al. 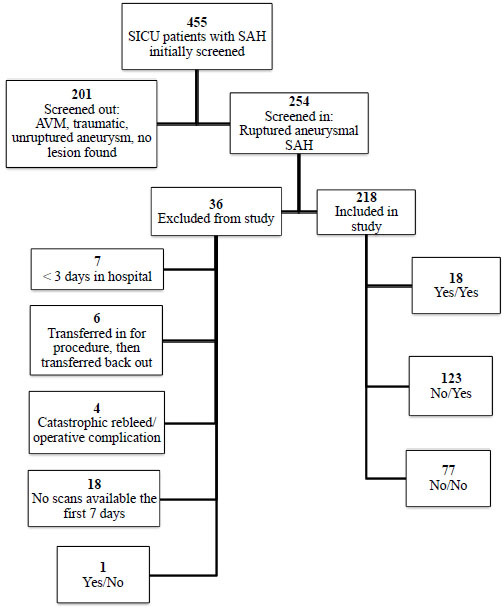 Endovascular treatment or neurosurgical clipping of ruptured intracranial aneurysms: effect on angiographic vasospasm, delayed ischemic neurological deficit, cerebral infarction, and clinical outcome. Stroke 2010; 41(11): 2519-24.